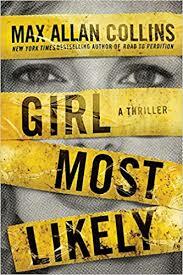 Max Allan Collins takes on a Midwest high school reunion in Girl Most Likely, a thriller where no one is who they seem to be, except perhaps Krista Larson, Galena, Illinois police chief. Known as the youngest female chief in the country, Krista is merely following in the footsteps of her father, a rencetly retired homicide detective. This is a scenic area, filled with tourists at times, a place where the crime rate is refreshingly low. That is, until this reunion, where the young woman voted “Girl Most Likely to Succeed” returns to flaunt her career as a TV news anchor and investigative reporter. Astrid Lund has left many hearts broken in her wake, and friends who she’s left in the dust. Krista has just broken up with her boyfriend, and takes her father to the main event, held at a lodge where many of those from out of town are staying, thanks to yet another classmate. Several teachers show up at the reunion, and there’s the usual rash of broken romances and gossip to talk about. Then Astrid is found dead and the page-turner takes off, but will her death be the last? Instead of partying with her classmates, Krista slips into her chief’s role and begin the arduous task of flushing out the killer. To help her with this, she enlists the best detective she knows—her father–as a pro bono consultant. With a department as small as Galena’s, she needs all the expertise she can muster, while hoping to avoid calling in state authorities. While Keith Larson finds himself traveling Chicago and getting involved in a mob subplot (remember, this is fiction!) he adds a nice counterpoint to Krista’s moves back in Galena. With a death of another student found in Florida tied into one in Galena,Krista looks for connections. Although this is her first homicide investigation,she forms a plan and runs a tight investigation with her small crew, Tinterviewing everyone who attended the reunion. Krista chooses her “favorites” to interrogate herself, those she deems more suspicious than the others, based on their shared history and her own knowledge. There will be several friends she upsets as she pursues a killer, those not used to Krista in her role as chief. Part police procedural, part mystery, there’s enough here in terms of character and setting for Krista and her dad to form a detecting team for a series, if Collins is so inclined.